Mind Over Mushroom Challenge, Day 18: Where’s The Beef? 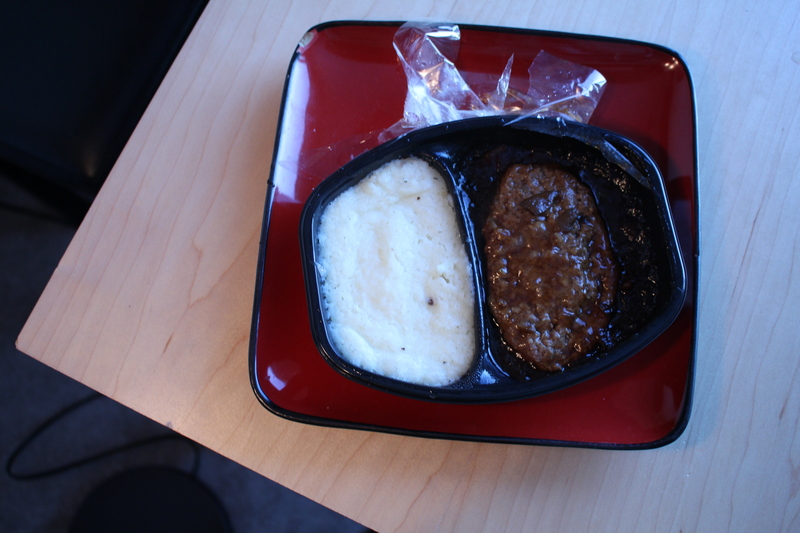 I ate a Salisbury Steak in “rich gravy” for lunch. The most disappointing thing wasn’t actually the mushrooms. It was the bite-sized hunk of what they called steak. While the mushrooms were terrible in that they were the kind you’ll find in pre-packaged food, my dislike for them was actually surpassed by the disgust I held for the steak. It’s a different kind of disgust from my mushroom disgust. It’s the same difference of when your parents say “I’m not mad. I’m just disappointed.” And it cuts you right to the core. I was the disappointed parent today, slowly shaking my head at what people are calling steak. It even came with a “tastes like home” guarantee. Sorry, but no it doesn’t. I come from the land of AAA beef piled up in freezers all across the county. I know a good steak when I eat one. This sucker was so low on the steak scale it didn’t even compute. I mean, I’m struggling to even say that it’s real food. First of all, it doesn’t matter how tender a steak is – you should not be able to cut it with the edge of a fork, especially as easily as I did with this one; it was pretty much like eating beef flavoured porridge. Second, it shouldn’t be all pasted together like a grey, somewhat edible version of plywood. Third, no steak should ever be cooked in a microwave! Am I a steak snob? No. I just have steak standards. I guess the lesson here is that no matter how much you dislike something, there is always something worse out there to distract you. Geez. That’s a little depressing. Let’s end this a bit more positively. When things seem bad, just know that they only seem that way because you’ve also had/seen/experienced better and that it still exists out there somewhere. Like a good steak. They’re out there. You (I) will find it. ← Mind Over Mushroom Challenge, Day 17: Holy Shiiiiiiiiiiiiiitttttake.